Don't you want to take responsibility for your designs? I’ve been experimenting with simple ways to record software design heuristics. I want to find ways to vividly bring to mind the design heuristics I use or learn about from others. Ideally, any written heuristic should be shorter than a software pattern and somewhat more detailed and informative than a single pithy phrase. For a good overview of the benefits of notetaking, read this lifehack article by Dustin Wax. If nothing else this should inspire you to jot down and/or draw by hand the key bits of the next talk or lecture you listen to. What we write we remember. Once you’ve written some tried and true heuristics in your own words, you can share them with others. Even better, use these heuristics to stimulate a deeper discussion into the design heuristic space you are exploring. Don’t shy away from discussions about nuances, counter-examples, edge cases, and competing heuristics (alternative ways to tackle a specific design problem). You may uncover a wealth of new heuristics to ponder and open up your mind to new ways of solving familiar problems. If the person you are conversing with doesn’t know much about the topic area of your heuristics, the questions they ask will likely lead you to clarify your thinking (or at least improve your explanations). They won’t get what you are saying if you speak too much in shorthand. If they know more about the topic, you may have a lively conversation about heuristics and lessons they’ve learned over time. They may validate your heuristics as well as give you some new ideas. I’ve been playing around with using index cards as a means to quickly capture a heuristic. I structure a heuristic in three parts: a question, the answer (which can be then polished into a couple sentence heuristic), and an example or two to help me remember. 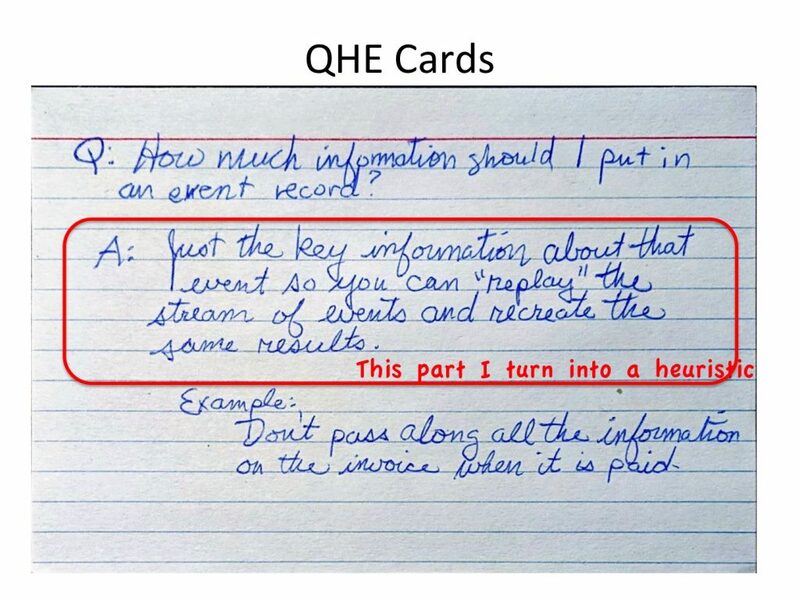 I call them QHE (Question-Heuristic-Example) or “Q-Hee” cards, for lack of a better name. 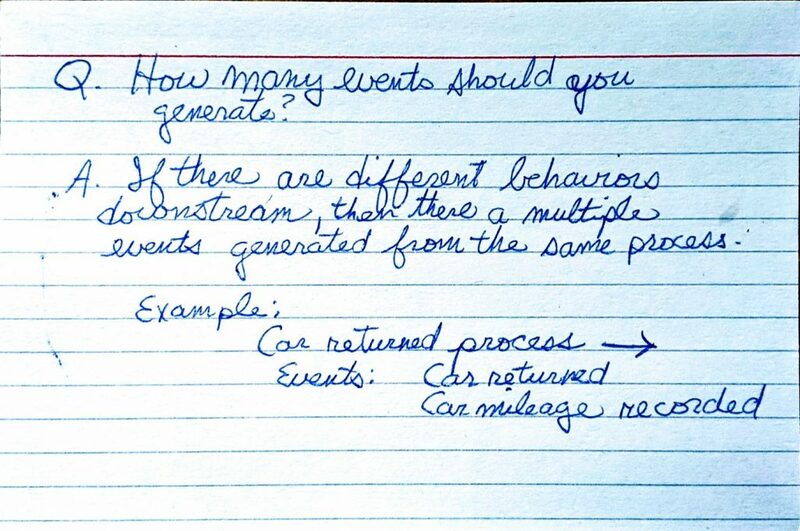 Using index cards to record design heuristics is inspired by CRC (Class-Responsibility-Collaborators) cards invented by Ward Cunningham and Kent Beck and popularized in my first design book. I like index cards. Heuristic: Only include information necessary to “replay” an event and achieve the same results. Don’t include sensitive information or extra information simply because you think it might be useful. An example or two to jog my memory is essential. And just like CRC cards, they can be too terse for others to understand (or to remember, if I wait too long). To make a heuristic memorable, I need to actively integrate that heuristic into my design heuristic gestalt. This is especially true if it is about a design topic I am not that familiar with. To create a stronger memory and deeper understanding I can write more about the heuristic, sketch out a more detailed example, write some code, and/or draw a diagram…whatever it takes to go a bit deeper. You need to balance passing along information needed by downstream processes in a single business event with creating multiple event records, each designed to convey specific information needed by a specific downstream process. How do you know how many events to generate for a single business process? If different processes downstream react differently, generate different events. For example, handling a “rental car return” request might generate two events and event records: “car returned” and “mileage recorded.” Even though the mileage is recorded at the time a car is returned, mileage could be recorded at any other time as well. It is a cleaner design to generate two events, rather than cram information into a single, overloaded “car returned” event. The act of writing a bit more detail in a gist often leads to further questions which lead to even more design heuristics. For example, these questions quickly come to mind: When is it OK to pass along extra information in an event? When is it not OK? What kinds of information should never be passed along in an event record? What happens if a new business process needs slightly different information? And that’s the point. There are a myriad of details to work out for any real design. And many more heuristics for solving design problems and learning to live with their consequences. By writing down your heuristics, you’ll remember what you were thinking at the time. Note to future self: That effort just might be worth it! In early April, I spent a fun weekend at Pace University with Allen Wirfs-Brock and Mary Lynn Manns speaking with students of Pace University’s Doctor of Professional Studies in Computing program. It was a good opportunity to reconnect with Mary Lynn and to hear about new patterns in her latest book, More Fearless Change: Strategies for Making Your Ideas Happen. Mary Lynn and Linda Rising have been working on these patterns for over a dozen years. They aren’t finished (curating long-lived patterns is an ongoing task). 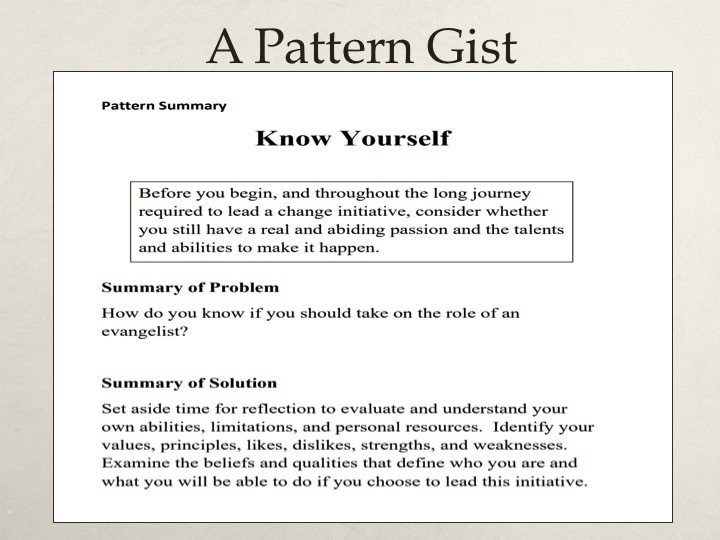 They continue to collect and write patterns for those who want to initiate, inspire, and sustain change in organizations they are part of or in their personal or professional life. Significant change often includes performing an ongoing series of experiments. One new pattern (or strategy) in their book is Future Commitment. This one has hooked me many times. Instead of asking a busy person for immediate help, ask them do something you need later and then wait for them to commit. Don’t worry about trying to get them to agree right away. Be patient. Keep in touch. Provide them regular information that encourages them to become more interested in your change initiative. Don’t be a pest. Once they agree to help, solidify their commitment by recording the date and sending it in writing (along with gentle reminders so they are kept aware of their commitment). Reminders can be annoying. So include an update of what is happening and how their contribution will fit as part of a reminder. Have an alternate lined up in case that busy person can’t commit. There’s more to this strategy and the psychology behind how people commit (along with 14 other new strategies) in their book. Like Mary Lynn and Linda, I don’t view change patterns as evil or manipulative. They are simply tools, that once aware of, you can use to engage people and get them to help you make changes. And so here’s a future commitment if you have an urge to write about your agile experiences: We need experience reports for Agile 2016. Submit a proposal to the Agile Experience Report program. Do it soon. Within the next 30 days. You don’t have to start writing now, but if you send in a proposal to me, it will grab my attention. Even better, if you are attending Agile 2015, we can also talk over your proposal. We ask that you write up a proposal so you get in the practice of collecting and communicating your thoughts in written form. You could wait and submit your experience report idea via the Agile conference submission system in November. If you do, your chance of it being selected is limited. The format of the submission system makes it difficult to include details or have an ongoing conversation to sharpen your ideas. This year we had maybe 100 submissions from which we selected 20. If you wait to submit your proposal via the conference system, it will have to really stand out from the crowd to grab our attention. Instead, if you submit your proposal to the Agile Experience Program, it will be carefully read as soon as we receive it. If selected, we will work with you throughout the coming year. You don’t have to start writing immediately. You will get help from a shepherd as you write. As soon as you finish, your work will be published on the Agile Alliance website. You will be also invited to present your report at a future Agile conference. 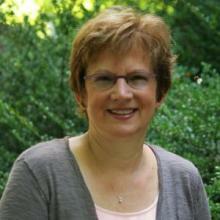 I’m ready to help you write about your experience if you are ready to make a future commitment to writing. It all starts with your proposal.